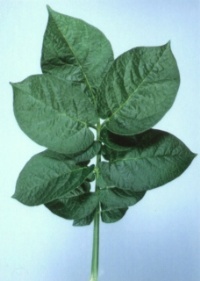 medium height, semi-erect; stems weakly pigmented; prominent waived single wings; nodes swollen. 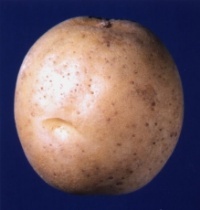 medium green, closed; midribs and petioles not pigmented. 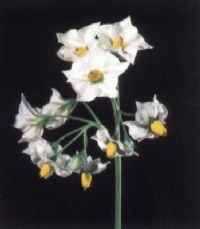 Primary leaflets: three pairs; ovate; tip cuspidate; base cordate. Terminal leaflets: ovate; tip cuspidate; base obtuse. 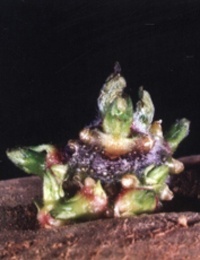 medium frequency, corolla white on both surfaces, medium size; orange anthers; flower buds weakly pigmented; calyxes and peduncles light green. 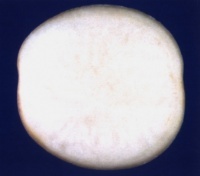 round to slightly oval; smooth white skin; shallow eyes, predominantly apical; white flesh. spherical; red-violet; base moderately pubescent, strongly pigmented; tip weakly pubescent, weakly pigmented, closed habit. 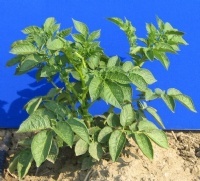 Medium yielding variety of very attractive appearance; well shaped and uniform sized tubers; good resistance to internal defects such as hollow heart and internal necrosis. Long dormancy period; good storage capability. High specific gravity. Remark: pre-cutting or warming seed is recommended. golden nematode (Globodera rostochiensis Ro1). early blight, corky ringspot (Tobacco rattle virus symptoms), powdery scab. © 2019 Murphy's Seed Potatoes, All Rights Reserved.